Grease up the chimney and stretch out the stockings, this Christmas episode requires no introduction. Jam in the earbuds and crank up the volume. Tales From The Trough is the perfect listening to avoid your relatives asking about your future or to drown out John Lennon's "And So This Is Christmas". Good evening kiddies, it's time for another short survey through the morbid morass of our Trough! Tonight's show is a little light in the loafers if you get my drift FART_NOISE.wav but don't you fret! The Ovenmen are Svennies little helpers, and are currently locked away all the way up in Hyperborea, working on something SUPER SPECIAL for CHRISTMAS. Get your pink sleeves prepped cause your stockings are gonna get STUFFED! We hope this'll hold you're appetite until the 25th, until then... ta ta! You there! Where's your shame? Put down that Jack 'o Lantern and pick the candy corn off your pecker. Tonight is the Holiest of nights! Tonight the hallowed halls of the Oven-realm are the closest to our cold and dismal plain. Can you hear them? They're all around us? They're here!!! Ohhhh the ritual must have been a success, as the Ovenmen are pleased with our sacrifices! Here kiddies, is THREE HOURS of tricks, treats and traps! 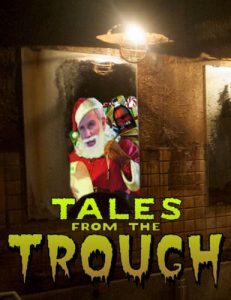 Turn off the lights, put your head phones on and dive into the auditory nightmare of TALES FROM THE TROUGH! Well hello there you devious dregs of dissident deliberations, and welcome to another scintillating series of sublime shitposting! The Trough has room for one more, why don't you step right up and get comfortable! This evening, we set our glistening gaze onto the fictive, the frivolous, the fraudulent facets of Fantasy! Wizened Wizards, oafish Orcs and diminutive Dwarves aren't all that you'll find as we journey into the nether realms of this genre! So unzip your fly, drop your pants and prepare for some titillating Tales from the Trough! It is our great honor to invite you, our lovely, lecherous listener for yet another sybaritic slosh in the shivery shallows of our Trough. This evening, we turn our browneyes forward---to Man's inevitable destiny of utopian transcultural tolerance! Welcome... to Tales of the Trough. A collection of horrific short stories, hand selected by the Crypto-Keeper and presented by the Troughman himself, for your enjoyment. We thank our sponsors for their support.